When I first applied to be a writer here at MakeUseOf, one of the things I suggested, and wanted to see more of, was hardware based articles. I didn’t necessarily mean that we should cover the newest type of hard drives or the best MP3 players out there, like the blog Gizmodo does, but just that we should give tips on all aspects of computers whether it is web based, software based, or hardware based. I wanted to present to you, our lovely readers, with accessible and useful tips on hacking your hardware, to hopefully extend your expertise or rouse your interest in something other than what MakeUseOf usually covers. Thus, for my first hardware article, it is only proper for me to pick a topic that many people would be familiar with, based on technology that most people, if not every one of our readers, would have in their homes: Ethernet cables. Now you might be wondering why you would ever need to know how to make your own Ethernet cables. Well, let me ask you this: when you look at your Ethernet cable, is it spooled in coils, because it is much too long? Has the little tab on top ever fallen off, and rendered your cable useless? Does your cable look completely fine, but for some strange reason, just does not work? Well, then this article might be useful to you. As for myself, I work at a technology center that deals with networking cables on a daily basis, and we also sell these cables to our customers. Many of these cables we sell are ones we make and test ourselves, so knowing how to make an Ethernet cable is a necessary skill. Now, I will pass this skill on to you. 2. An Ethernet crimping tool – not very expensive. I looked it up online, and you can find some for under ten dollars, although most are around the 15-20 dollar range. 3. Ethernet Connector – These aren’t very expensive either. A bag of fifty goes for about nine bucks on Amazon. 4. Either a spool of cat5e cable, or an existing Ethernet cable- On Froogle, I’ve seen 100ft spools of Cat5e cable go for as little as $3. Optional: Wirecutters. I just use scissors. First, if you’re simply shortening your cable, you should cut your cable to however long you need it to be, plus two or three inches extra, in case you mess up. If you are making an entirely new cable from a spool, then cut your cable with a margin of about four to six inches. If you’re just replacing the connector, then just cut the connector off. Now that you have a clean, cut wire, you need to make an incision about one inch down. You can use a wire cutter that is especially made to cut Ethernet wires, but I prefer to just use a pair of scissors. Be very careful not to nick any of the wires inside, though, or you will need to cut the entire thing off and start again. Make a few shallow incisions all the way around, and then pull the rubber casing apart; this is the safest way to cut the casing off without damaging the inside wires. As you can see, the casing contains four sets of two twisted wires, one solid color and one striped color. After you pull the casing entirely off, untwist the wires from each other, and straighten them out as best you can with just your fingers. Using a tool at this point would be too risky, because you wouldn’t want to risk damaging the inside wires. In the picture above, you can see the order that the wires need to be arranged in. If you can’t tell distinctly from the picture, the order should be from left to right, white/orange, orange, white/green, blue, white/blue, green, white/brown, brown. Fan the wires out and make sure they are as straight as possible, and then line them up so that the wires lie flat next to each other, maintaining the order you arranged them in. Place your thumb firmly over the lined up wires, effectively pinning them in order, in place. At this point, if the tips of the wires are not even with each other, snip them so that the tips form a straight line, but be careful not to cut too much. You’ll need a bit of excess wire to push into the connector, as you will see later. Now, pick up your connector, and make sure that the flat side is facing upwards. If you look at the connector, you can see that there is a distinct slot for each wire at the very tip of the connector. Keeping your thumb very firmly over the wires, push the wires into the connector, being very careful not to let the wires slip out of order, or become misaligned. Keep pushing the wires in until the tips are touching the top edge of the connector. Look through the tip of the connector, and if you can see the copper innards of every wire, then you’ve pushed the wires in far enough. Otherwise, you can try to adjust the misaligned wire using a pair of tweezers or pliers, or take the entire bunch out and try again. Once you’ve made sure that all the wires are properly fitted into the connector, plug the connector to the matching hole in the Ethernet crimper. Squeeze down as hard as possible, and you should hear a bit of plastic cracking. Most Ethernet crimpers have a spring that, when triggered by squeezing, does not release until enough pressure is applied. Otherwise, just squeeze as hard as you can for about 10-20 seconds, and then consider your Ethernet crimped. Now, you are pretty much finished constructing your Ethernet cord. The last step is to test it. 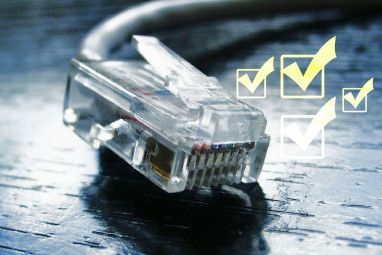 If you have a Net Tool, then you can test whether the Ethernet is wired correctly using the Net Tool. In the picture, all of the lines are parallel and unbroken, except for the last one, and this denotes a correctly wired and working Ethernet. 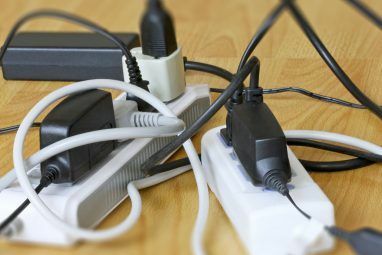 If one or more of the wires are crossed with other wires, then you probably arranged the colored wires in the wrong order before pushing them into the connector, or the wires rearranged themselves while you were attaching the connector. If one or more of the lines are broken, then of of your colored wires is either damaged, or not pushed far enough into the connector. Perhaps you found this article enlightening, and thought that it might be an interesting weekend project to try. Perhaps you think this is just useless knowledge that will never be put into use. Either way, we would love to know what you think of these hardware articles, and what you’d like to see from us in the future. Leave us your comments, and tell us where to go from here! Very useful info and well explained, thank you. 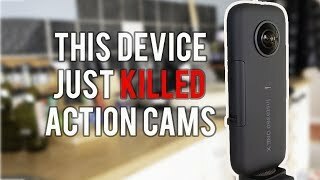 Great article, especially in this need a video environment today, as I do. what a change, "thanks and keep em comin". This article made me a return customer. Thank You. Its been very helpful and interesting but need to upload the video tutorials for that. Thanks..
"This is a skill you need"
Any good How To article has to have step-by-step instructions and great pictures. This article has both. There is not much difference from making up telephone cable and ethernet cables. I have made up telephone line as I need them. The only difference being the number of wires, connectors and the crimping tool. I am about to complete my home network with both wired and wireless connections. I guess that I have to go out and purchase an ethernet make your own cable kit. I never have enough tools in my tool boxes anyway. Far and away the best explanation on how to terminate ethernet cables I've found yet. THANKS! Excellent post. I agree with most of the responders here. We need more hardware howto articles. After all, a computer is much like an automobile. If you know how to fix it when it breaks it can last a very long time. It's unfortunate that many people treat computers like appliances and when something goes wrong with it, they discard it and buy a new one and repeat the same doomed cycle over again when their original PC was fine with a little TLC. This was a great and very informative article... although they aren't used much these days, I was wondering about the wiring process for crossover cables... aren't a couple of the wires in different locations from one end to the next? Thanks for an interesting, easy to understand article. Thanks for a simple and non jargonese solution to an every day fix it problem. Please continue with this type of article. MUO really has its s**t together. I've wired my house using a $99 CAT-5E kit I bought from Tiger a few years ago. It had a semi-decent set of crimpers, 100 feet of cable, a bag of rj-45 heads, and a so-so cable tester. 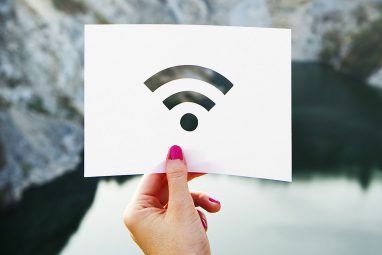 Wired connections are the way to go if you want guaranteed connectivity. It's more secure, too. Very detailed instructions. I remember this day on my first networking class, but I already new how to do it so I was a teacher that day :P I can cut, strip, put the wires in order, put a end up and crimp it all in about 15-20 seconds. When you have to run a lot of a cable from one hub room to the next, it takes a while you know. Having the ability to do it really fast, can save a ton of time! Great post! The only thing I don't have in my arsenal is one of those testers that can be used more than just testing a cable. I hope to see a lot more articles like this on MUO, keep up the great work! Thanks a lot this is something that i Have been looking for. Hats off to make use of. I love the idea of more hardware articles. I'm the kind of person who will take apart his brand new $2,000 laptop just to see what it's innards look like. I'm also returning to college and need to know all the shortcuts I can when it comes to DIY tech and saving money any way I can. Tell those Makeuseof.com gurus MORE HARDWARE STUFF, PLEASE! Thanks again! The Ethernet cables my internet provider gives me are CRAP! The plastic tabs immediately fall off, they don't work when I need them to and they're only 6 ft. long! I keep making my I.P. replace them as they break instead of buying new ones; it's a matter of principle. Also, I'm scared that all Ethernet cables might be as fragile or finicky and I don't want to waste money if the ones I'll be buying are as bad as the ones I already get for free. Are they? At any rate, it's wonderful to know how easily I can solve this problem. Thanks Angie! As a CCNA it's nice to see some articles about things such as this. It is important to note that for those who buy professional routers/switches for tinkering or small businesses that different orders of the interior cables are used for different cables. This article detailed straight-through cables, but crossover and rollover cables are just as easy. 7 Useful Ways to Reuse an Old Router: Don’t Throw It Away!